The past couple of weeks we have had to dodge the tropical storms – the wind has been from the South, South/East 5 -15 mph and the lake is below 15 ft.
As for the fishing we have had time to go out in the mornings before the rain comes. 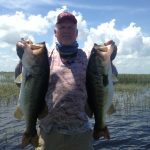 The best bit is still Spinnerbaits and Swim jigs in the Kissimmee grass. When the morning bit is over pitch/ flip everything you see. This week I have found some fish way back on the hard line. Good areas to fish is J&S, Grassy Island, Kings Bar and Tin House area of the lake. Here is a picture of a couple of fish I caught this week. You can check the water level of the lake at www.okeechobeejust4bass.com.